Checkpointing is a process by which we can establish a point from which we can resume a long running job, without losing any of the work done prior to the checkpoint. This technique can be used only if it is not important that the entire set of changes be handled as a single transaction, for example a mass update to initialise the value of a new field, when that field is not yet being used. What we’ll need is to break the update into smaller transactions that can be committed individually. Each transaction will be small enough that we don’t take out too many or too broad locks before committing, and small enough that the transaction tracking overhead in SQL Server doesn’t cause any problems. (For massive transactions, that overhead can become significant) The transactions still need to be large enough that we don’t incur additional overhead from starting and committing new transactions too often. In the example job below, I’ll use 500 records as a chunk size. // Include a where-clause to exclude any records we have already updated. // This makes the process resumable. // Perform the field updates needed. // I call a calculation method here, but use whatever way you prefer. // as it results in fewer database calls. It also causes fewer locks. // we're committing the current transaction and then starting a new one. The trick is in the ttscommit/ttsbegin pair in the middle of that code. 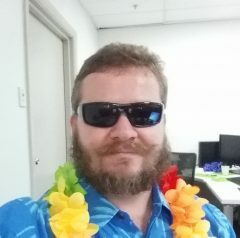 If the job is terminated part way through, all the work done up until the last ttscommit will have been committed to the database, and will not have to be done again. In the example, I have included a where-clause to exclude any records that have already been updated. No XPO this time, as you should be able to just copy/paste and adapt the example to your needs. Next Next post: Introducing the "Network of things", or… "Notwork"